Canberra can do more to inject a measure of purpose and connection into bilateral ties. The secret of success is constancy to purpose—at least that was Disraeli’s view. It is a pity that recent Australian prime ministers and foreign ministers, Liberal and Labor alike, have failed to see ‘constancy to purpose’ as the central precondition for successful bilateral relationships. The rocky relationship with Indonesia is a case in point. Constancy and purpose are conspicuously absent. Quite simply, neither Indonesia nor Australia have been able to articulate what they want out of the bilateral relationship, except for vague notions of ‘stability’, ‘security’ and ‘good relations’, which mean different things in Jakarta and Canberra. For Australia, the lack of purpose is a more acute problem, because we need Indonesia more than Indonesia needs us. Yet we appear unable to design and implement consistent, coherent and purposive policy settings on which to develop a sound, long-term relationship with a country that has a GDP that is moving towards parity with ours and a population almost ten times the size of ours. 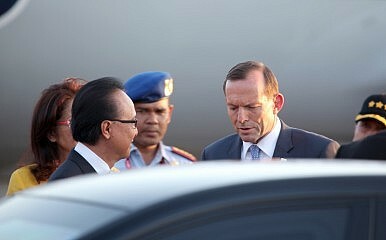 There are evident signs of inconstancy in Australia’s approach to Indonesia. How quickly we have become distracted by changes in Indonesia’s political leadership and President Joko Widodo’s lackluster performance. How unsubtle were the efforts by both Prime Minister Abbott and Foreign Minister Bishop to persuade President Widodo and Foreign Minister Marsudi to stay the executions of Chan and Sukumaran. How easily we took offense at President Widodo’s refusal to exercise clemency (recalling our Ambassador ‘for consultations’ was an unprecedented step). How brittle our responses have been to both the electronic eavesdropping and ‘cash to captains’ questions raised by the Indonesian government. How peeved we continue to be that Indonesia isn’t working harder to solve our refugee problem. And how concerned we remain that Indonesia isn’t prosecuting the ‘war on terrorism’ with the energy, exuberance (and shrill hyperbole) of Australia. The fundamental problem is that the relationship with Indonesia is conducted in the arena of domestic politics rather than international policy. And where the dog whistle is amplified through our preferred instrument of diplomacy—the megaphone—is it any wonder that the bilateral relationship is under stress? Former Indonesian Foreign Minister Marty Natalegawa, speaking at The Crawford School on Monday, was right to identify ‘a sense of disconnect’ in the present relationship, reinforced by a moribund ‘sense of communication’. What Natalegawa failed to mention was that he helped create this predicament by playing sensitive bilateral issues (electronic intelligence collection) into Indonesia’s domestic politics in the lead-up to the Presidential election in mid-2014. So how might we inject a measure of purpose and connection into Australia–Indonesia relations? We might first identify what we want from Indonesia. Our long-term economic, diplomatic and security interests are best served by an Indonesia that is stable, democratic, prosperous and confident as a contributor to the development of a rules-based international system. Second, we should identify what Indonesia wants from us. That’s a bit more difficult, since Indonesians are reluctant to indicate preferences, much less to make demands. But more than anything else, what they want from Australia is respect, understanding, support, quiet engagement and constructive advocacy of their growing role as a regional and global player. Third, we must identify the tools we need. Our bilateral diplomatic history suggests that enduring relationships at the senior political level are fraught, and subject to sudden and intense disruption. Prime ministers, presidents and foreign ministers rarely have the diplomatic or negotiating skills to sustain a robust and enduring relationship. Yet at the institutional, functional and bureaucratic levels, Indonesia and Australia have long been able to maintain effective and practical relations, even during periods of political tension. In Australia’s case, governments rely too much on the political levers of relationship management when they have a considerable range of alternative instruments at their disposal. Menzies, for instance, was able to demonstrate during Konfrontasi that, notwithstanding a political relationship that was at its nadir, both sides could maintain a wide range of functional linkages. This wasn’t the result of some kind of Nelsonian blind eye on the part of either Soekarno or Menzies, but rather an acceptance that relationship management was a matter of policy, not simply a political issue. Howard displayed similar skills as Timor-Leste emerged from a quarter of a century of Indonesian ‘incorporation’. The trick here was to play to Indonesia’s unusual ability to manage relationships by remote control—the shadow play as a representation of more substantial realities. The Abbott government has an even wider range of levers than Howard had. Through our banks, Telstra, our universities, government departments and agencies such as DFAT, AusAID, Defence and the AFP, Australia is able to engage in substantial ways without turning the political spotlight onto the relationship. There is, of course, much more that could be done. First, there’s a desperate need on Indonesia’s part for institution building—something that Australia could do well at on many levels. Second, Indonesia would benefit from quiet assistance in developing governance models for its departments, agencies and state-owned enterprises to reduce and eventually eliminate corruption. Third, a change of emphasis in the political relationship away from a focus on the executive as political agents to a focus on the democratic institutions as political forums would draw much needed attention to the processes of democratic politics as distinct from the (often clumsy) management of hot political issues. Symbolism is a powerful political medium in Indonesia, and Australia’s recognition of and support for the role of Indonesia’s parliament would boost Indonesia’s confidence as an Asian democracy. Finally, on sensitive policy issues such as climate change, refugees, agricultural trade, education services, drug smuggling and security cooperation—especially counterterrorism—Australia would do well to pursue a ‘softly softly’ approach, allowing the agencies to do the hard work while political leaders provide modest encouragement from the sidelines. This, of course, would require a level of intelligence and tact—the cornerstones of diplomacy—that neither side seems capable of at present. Allan Behm is a former head of the International Policy and Strategy Divisions in the Australian Department of Defense. This was originally published over at The Strategist, the official blog of the Australian Strategic Policy Institute (ASPI), here.